Likes: To be with his people but doesn’t have to always be “on” his people. He also likes to run outside with the other dogs in the fenced in yard checking out what is happening in the neighborhood from the safety of the fence – in other words he is very curious. His favorite meals consist of soft food, and especially loves soft treats. Dislikes: Having to go in the crate at night – although once in the crate he lays down and falls quickly asleep (snoring away). 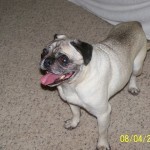 Lucky is from a shelter and is up to date on shots, will receive dental and vet care and will be in foster care soon! Looking forward to an update from the foster home soon. Update from foster home – What a sweetheart. He totally bonded with Chuck. If Chuck leaves the room, Lucky is on his heels. I am so used to that with our 2 boxers as they are my constant shadows but don’t follow Chuck around and now he has his own shadow who doesn’t follow me. lol. Right now he is laying between Duke and Duchess. They have accepted him and he seems to like them too so all is well there. At potty time he runs out with them does his job and is happy to come back in when they do. He has lifted his leg in the house a couple of times but we have caught him before he has done anything and gotten him redirected to outside. I am sure that with a neuter and our diligence he will do fine potty training. That is the reason on his paperwork that he was surrendered to the shelter for “soiling” inside. I guess people don’t realize that neutering helps that issue greatly as does routine. He knows his name, comes when called, and is a bit of a character. When Chuck is near he has to be on his lap but as I write this- Chuck is outside and Lucky is laying on the floor with the others. Funny. He sleeps through the night -snoring with the rest of us and is just a happy little fellow. He will be making an appearance at the Meet and Greet on September 8th!